The study, titled, ‘The State of Nutrition Among Children In Parliamentary Constituencies Of India’, whose lead author is S.V. Subramanian, Professor of Population Health and Geography at Harvard University. 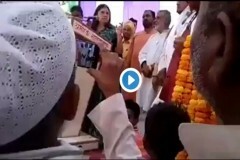 As India fights the scourge of malnutrition through its flagship Poshan Abhiyaan programme, large swathes of parliamentary constituencies across the states of Uttar Pradesh, Rajasthan, Madhya Pradesh, Bihar, Jharkhand, and Gujarat are seen to have “very high burden” of child malnutrition indicators, like stunting, underweight, wasting, low-birth weight and anaemia, a Harvard University study, helmed by an Indian-origin researcher, has found. The study, titled ‘The State of Nutrition Among Children In Parliamentary Constituencies Of India’, whose lead author is S.V. 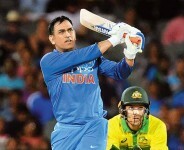 Subramanian, Professor of Population Health and Geography at Harvard University, says there is an urgent need to regularly collect, report, and analyse data by the Parliamentary constituencies and for monitoring and surveillance of malnutrition indicators. According to the study, Bahraich in Uttar Pradesh has the highest prevalence of stunting among children - at nearly 64 percent. 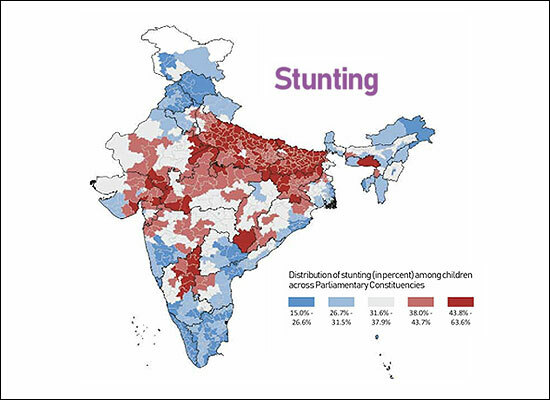 Among the 20 parliamentary constituencies that have the highest stunting prevalence of stunting are Nalanda, Sitamarhi, Hajipur in Bihar, Bahraich, Shrawasti and Kaisarganj in Uttar Pradesh, and Aurangabad in Gujarat. The 20 constituencies with the lowest prevalence of stunting are mostly in Kerala. The stunting prevalence in India is 38%, with the absolute gap between the highest and the lowest stunting prevalence across Parliamentary Constituenciess at 49%, says the study. With regard to underweigt children, the highest prevalence is in Singhbhum, Jharkhand, at 61 percent. Khunti, also in Jharkhand, is among the 20 parliamentary constituencies with the highest prevalence of underweight children. Shahjahanpur and Jaunpur from UP, Purulia from West Bengal, and Morena from Madhya Pradesh also feature in the top 20 constituencies. 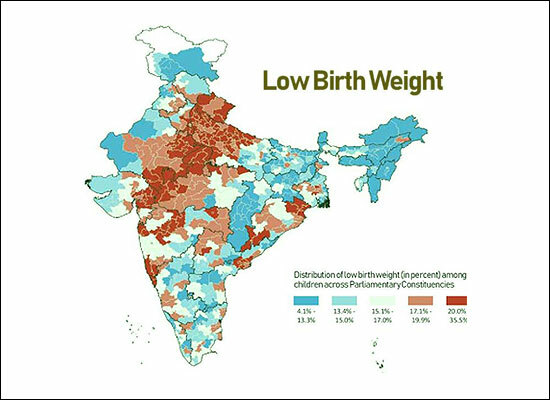 Among the 20 constituencies with the lowest prevalence of underweight children are many from Kerala, as well as Anantnag in Jammu and Kashmir. 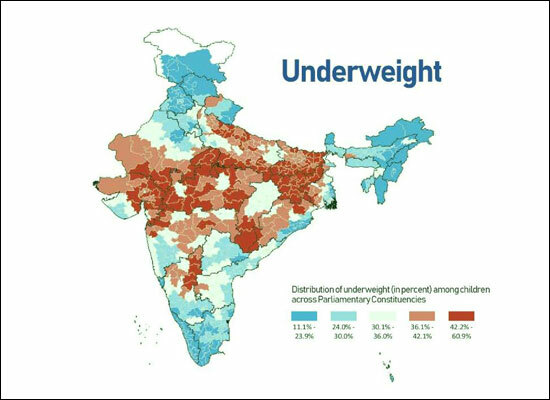 It says the absolute gap between the highest and the lowest underweight prevalence across Parliamentary Constituencies is 50%. 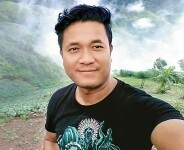 With regard to wasting, Jamshedpur in Jharkhand has the highest prevalence of 40 percent, while the lowest prevalence is found in Inner Manipur, at 6 percent. With regard to low birth weight, the highest prevalence is found in Mandsaur, Madhya Pradesh, and the lowest in Mizoram. 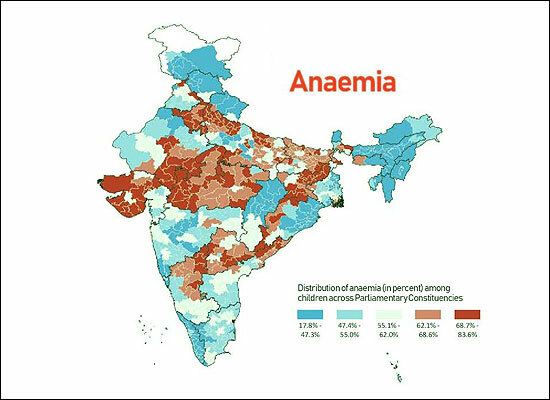 With regard to anaemia among children, the highest prevalence is found at Dadra and Nagar Haveli at a high of 84 percent, with Kollam in Kerala with the lowest prevalence, at 18 percent. 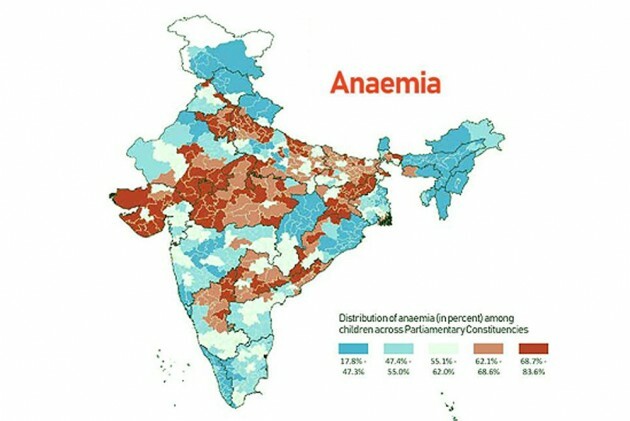 Among the parliamentary constituencies that feature among the 20 with the highest prevalence of anaemia are in the states of UP, Rajasthan, Madhya Pradesh, Gujarat and Jharkhand. The study goes on to provide detailed analysis of the other indicators like underweight, wasting, low-birth weight and anaemia. 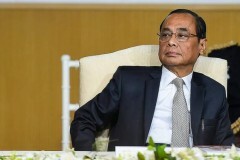 It says the availability of such data is critical not only to help understand how the various Parliamentary Constituencies are performing, but also to “foster comparisons and conversations” among the Members of Parliament to promote action on dismantling barriers to health and health equity. The researchers have used state-of-the-art methodologies and the 2016 National Family Health Survey for the study.